John Thompson and Associated Companies, of Ettingshall Engineering Works, Wolverhampton, Staffordshire (now West Midlands). Telephone: Bilston 41491. 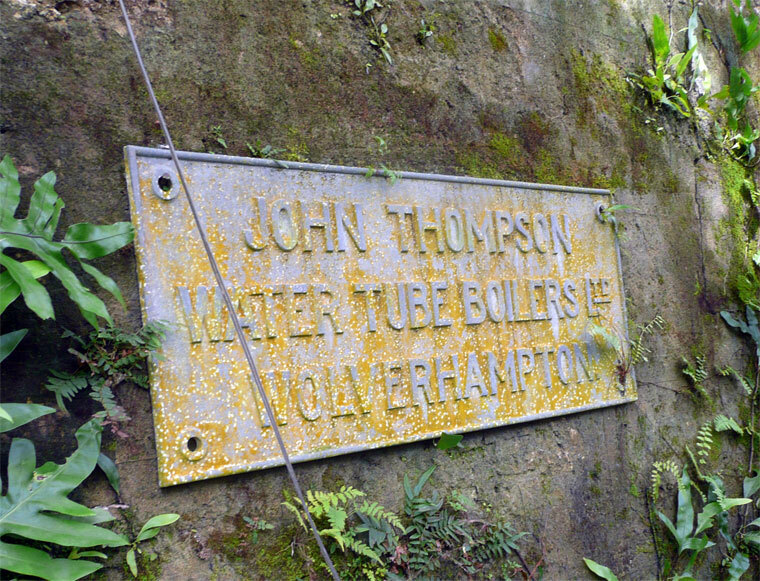 Telegraphic Address: "Boiler, Wolverhampton"
Sometime between 1834 and 1840, William Thompson established himself as a boilermaker and maker of canal boats at a works situated on the Birmingham Canal, at Highfields near Bilston. c.1850 The business ran into difficulties and was taken over by William's younger brother, Stephen. William's son, John, continued to learn his trade under his uncle, Stephen, and became progressively more responsible for running the company. c.1860 John Thompson bought the company from Stephen on a ten year deferred agreement. 1860 John Thompson joined his father in partnership under the title of William Thompson and Sons. Their works were at Bilston, Staffordshire. By 1862, the firm had assumed the name of William Thompson and Son, although John Thompson was the owner and driving force behind it. 1868 Described as manufacturers of sheet iron, nail kegs, casks and cisterns for containing naphtha, blast and stove pipes, colliery air pipes, steam boilers, iron boats and wrought iron girders. 1870 The partnership was dissolved and Mr. William Thompson retired. Mr. John Thompson continued the business under his own name. The works were moved to Wolverhampton. 1870 A decision was made to concentrate on the production of steam boilers. This is probably why the firm acquired a new site a few miles along the canal at Ettingshall. The equipment was moved to the new works by canal boat and hand cart. The works at Highfields continued to be operated. William, the oldest son of William the founder of the firm, may have been in charge although John seems to have been Managing Director. 1878 The founder, William Thompson, died. During the last quarter of the nineteenth century the firm built a considerable reputation. As it was rapidly expanding, a new Head Office on Millfields Road was constructed around the turn of the century. 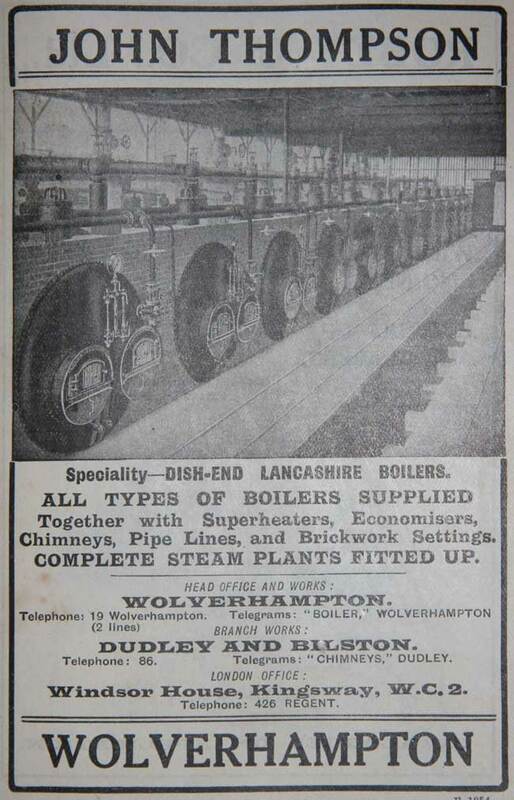 1896/7 Directory: Listed as makers of steam boilers. 1900 Windmill Works, Dudley was opened. c.1904 Until the turn of the century the company appears to have concentrated on boilers but, about 1904, a separate Motor Frame Department was set up, apparently on Stephen John's initiative, in a corner of the boiler works flue shop. It was created to manufacture chassis frames and pressings for the expanding motor industry. This department was later to become John Thompson Motor Pressings Ltd.
1909 John Thompson died whilst returning from a trip to Egypt, Greece and Palestine. By this time his sons, William, Stephen John, James and Albert, were taking leading roles in the company. They, and their sons in turn, ran, and mostly owned, the company for much of the twentieth century. Stephen John became a director and a Governing Director in 1912. "Successors to Thomas Bridges and Sons"
1912 Exhibited at the International Engineering and Machinery Exhibition at Olympia. Items shown included a water softening plant on the Kennicott system at work on the stand, and exhibits illustrating the construction of Thompson boilers with dished ends and corrugated tubes, and also a Thompson Mars bent tube superheater, and Thompson Mars economizer. 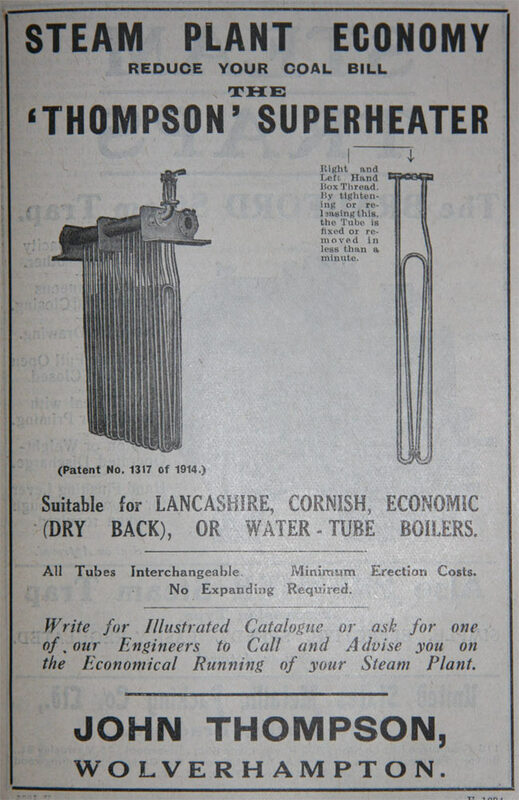 1914 Specialities: "Thompson" Dish-ended Boilers, Economic Dry Back Boilers, Water Tube Boilers etc. Employees 900. WWI. During the War, William and Stephen John were on active service, leaving James and Albert to run the company, which was heavily involved in war work. The motor frame section was at full pitch and other sections were making such things as steel cowls for Sopwith aircraft; engine plates and cowls for Sunbeam aero engines; sponsons for tanks; and cordite boxes. 1915 The Motor Pressings Department moved from the boiler works into a new factory in Davis Street, which had been built on farm land. This Department met with outstanding success, supplying frames to just about every car manufacturer, including the local firms Star Engineering Co, A. J. Stevens and the Turner Manufacturing Co.
1918 After the war, the company underwent a radical reorganisation and, rather belatedly compared with other companies of a similar size, became incorporated as a limited company. James Thompson, grandson of William Thompson, became the first chairman. 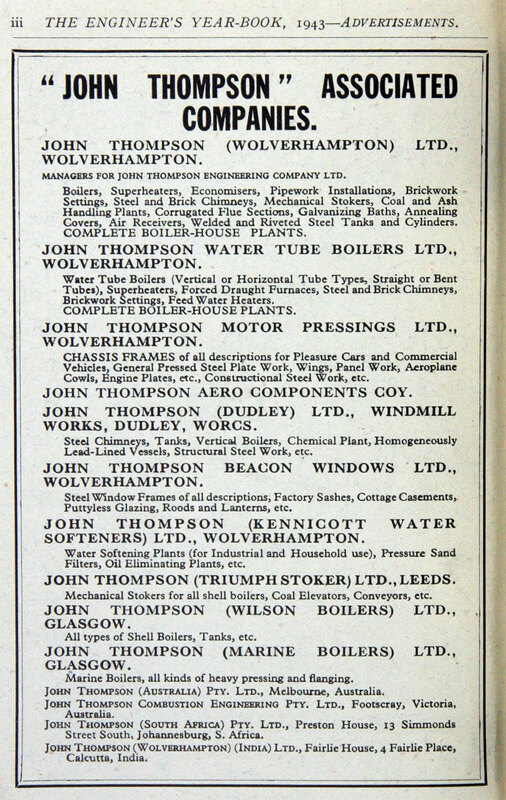 1918 Four limited companies were set up reflecting the 4 departments: John Thompson (Wolverhampton); John Thompson (Dudley); John Thompson Water Tube Boilers; John Thompson Motor Pressings (see separate pages). This seems to be the start of the company’s practice of running different departments as different limited companies, each of them subsidiaries of the main company John Thompson (Wolverhampton) (at this time). William John Thompson became a Governing Director. 1919 The company took over Taylor Windows of Shepherd Street, Wolverhampton and formed the Beacon Windows Co to carry on the business, building new works to do so. This company was run as a separate company until it was amalgamated with Motor Pressings in December 1966 to form John Thompson Pressings Division. 1920 The annual meetings of the 4 companies was held, namely John Thompson (Wolverhampton); John Thompson (Dudley); John Thompson Water Tube Boilers; John Thompson Motor Pressings. In the report it was stated that these 4 companies had "recently been formed" to take over the business of Messrs John Thompson. 450 of the employees were shareholders in the companies. Albert E. Thompson (one of the governing directors) presided in the absence of James Thompson. Lieut-Colonel W. J. Thompson and Major S. J. Thompson DSO, who were also governing directors, made speeches as well. 1920 As the company continued to expand, so did their range of products and services. 1924 Annual meeting of John Thompson (Wolverhampton) Ltd at its headquarters in Wolverhampton and also the 3 separate companies. W. J. Thompson was in the chair. Business had been very successful and profitable and the company was expanding. Experience with employees as shareholders had been an unqualified success. 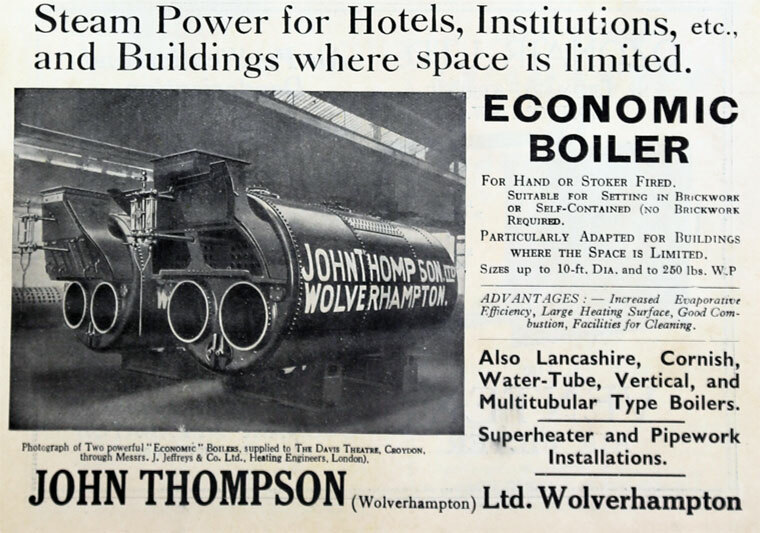 1929 Annual meeting of the associated companies of John Thompson Ltd, namely John Thompson (Wolverhampton); John Thompson (Dudley); John Thompson Water Tube Boilers; John Thompson Motor Pressings and Kennicott Water Softener Co. Those present included 3 governing directors and 450 employee shareholders. News of expansion in business including new factory in Australia to meet orders from there. 1930 Annual meeting of the associated companies of John Thompson included John Thompson Beacon Windows. Record year; 3000 employees; new enterprise in Australia: John Thompson Combustion Engineering Pty Ltd to manufacture the company's products. 1933 Acquired 80% of the shares in Wilson Boilermakers Ltd of Glasgow. 1936 Public company John Thompson Engineering Co formed with a share capital of £1 million, to acquire the business and assets of John Thompson (Wolverhampton) Ltd and buy the shares of the associated Thompson companies (which became subsidiaries of the new company) as well as the 80% of the shares in Wilson Boilermakers Ltd that it owned. Albert Edward Thompson (b. 1866) was the first chairman. Other directors were William John, Stephen John and Edward Walter Thompson. 1936 Acquired Triumph Stoker Co Ltd and Marine Boilers, a small Glasgow manufacturer of Scotch marine boilers. WWII: Each part of the business was involved in manufacturing for the war effort (see separate companies). At Aero Components there was a tremendous amount of activity - sets of tank ribs for the Blenheim bomber and other aircraft, containers for food drops from aircraft, seats for air gunners, gun covers and exhaust pipes. There were also rudder balance arm masts for Wellington bombers, anchor cable containers for Walrus amphibians, Gloster Gladiator gun covers, sea markers and practice bomb simulators. Because of the activity for the various ministries, many resident ministry inspectors were based at Thompsons to monitor the high degree of quality required. Apart from working overtime to meet the production targets, the men were also engaged in fire watching or in the Home Guard. 1943 The number of subsidiary companies listed in the annual report was 15. Post-WWII. Following the War, changes in technology led to a fall-off in automotive and aircraft work and there was a move towards the construction industry and its associated products, such as concrete mixers, digger buckets, stillages, etc. 1946 Joint venture formed with Henry Hope and Sons called Doorframes Ltd.
1948 The factory expanded to the other side of the railway, indicating that the company’s post-war recovery had been rapid. 1950 The small marine boiler factory in Glasgow was closed and the work transferred to the nearby Wilson Boilers plant. Although work in general had increased, some large contracts would not be delivered for several years, which represented work that was "uninvoiced" at the time of the annual report. 1953 The Wolverhampton Handbook stated that John Thompson Ltd’s premises covered 80 acres. 1954 Industrial Atomic Energy Group established in Manchester jointly by AEI and John Thompson to research the development of a larger atomic energy reactor. 1954 Purchase of B.V.C Industrial Constructions Ltd. from British Vacuum Cleaner and Engineering Co Ltd.
1955 Four industrial groups formed to exploit the information being made available by UKAEA on design of nuclear power "furnaces" - Industrial Atomic Energy Group involving AEI and John Thompson with electrical generating expertise from Metropolitan-Vickers and BTH. Other groups were English Electric Co and Babcock and Wilcox; C. A. Parsons and Co and Head, Wrightson and Co; GEC and Simon-CarvesLtd. During the late 50s and 60s the company produced a great variety of products including thousands of washing machines bowls for Hotpoint and Servis. John Thompson (Wolverhampton) Ltd - design, manufacture, deliver, erect on prepared foundations and commission shell boiler plant anywhere in the world. Also superheaters, economizers, pipework. Coal and ash handling plant, chimneys, various types of mechanical stokers for burning various types of fuel, special furnaces for burning wood, combustible by-products or wastes. And pressure vessels, galvanizing baths, annealing covers. 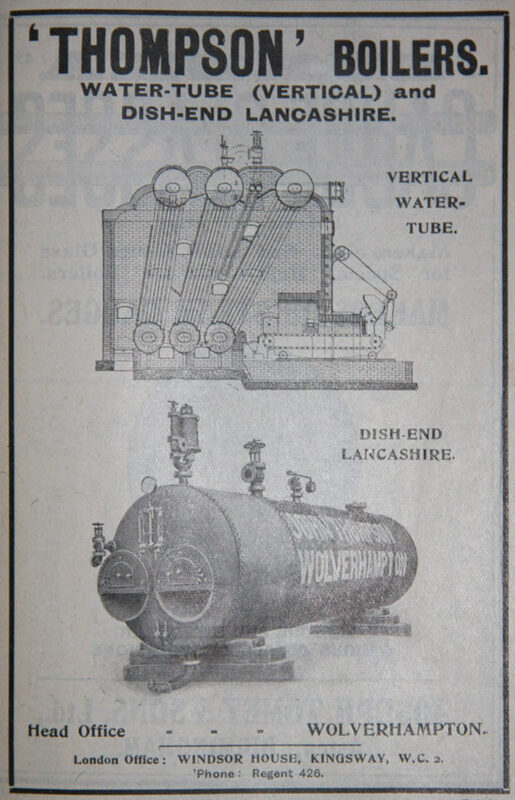 John Thompson Water Tube Boilers - Natural and forced circulation water boilers. Boilers of all types for land, marine and for utilizing waste heat. 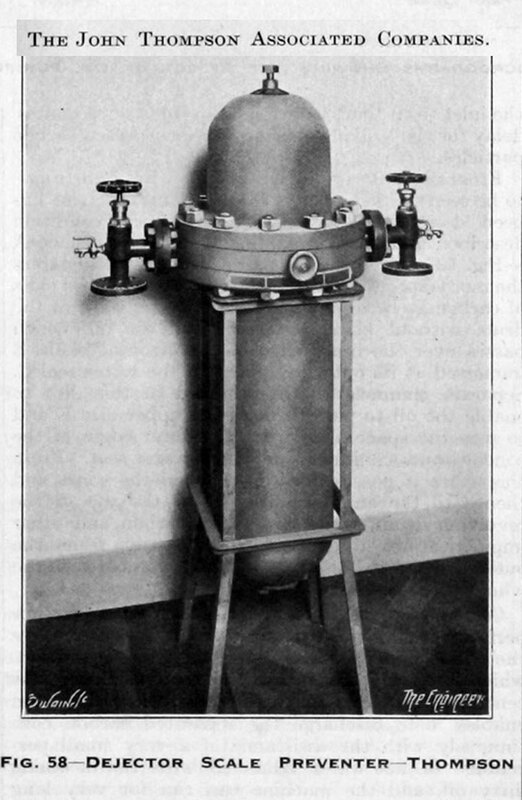 The John Thompson “Etaflo” steam generator – a boiler with a unidirectional flow, supplied for use in power stations. John Thompson (Dudley) - Fabrication of all classes of electrically-welded platework for industrial and chemical trades. This company included a chemical engineering department which specialised in producing pickling plant, galvanizing plant and acid recovery plant. John Thompson Beacon Windows - Metal windows for domestic and industrial buildings in steel and aluminium. ♦ The Pressed Metal Department steel door frames and partitioning and other building products. ♦ The Flooring Department open grid steel flooring and ladders for industrial buildings. ♦ The John Thompson Conveyor Company (not mentioned as Ltd. and apparently a part of Beacon Windows): Mechanical handling equipment for all materials. John Thompson-Kennicott Ltd - “For over half a century” manufacturers of water treatment plant for all purposes. This seems to be mainly for water going into boilers but includes "clarification and filtration plants for potable purposes". Metronic Instrument Co. Ltd - Manufacture instruments and control gear “to suit every possible industrial need”. John Thompson Castings Ltd - Foundry producing light and heavy castings for other subsidiaries and for industry generally. John Thompson (Wilson Boilers) Ltd - In Glasgow. Evaporating plant, causticizers and shell boilers. John Thompson (Triumph Stoker) Ltd - In Leeds. Mechanical stokers for all shell boilers and coal and ash handling plant. All of them “undertake complete boiler contracts of all types”. 1956 In the Handbook, the John Thompson Instrument Co seems to have taken over from Metronic. John Thompson Industrial Constructions Ltd, also appeared as producers of equipment for refuse disposal plant. John Thompson (Pipework) Ltd appeared, engaged in bending, forming and installing pipework for boiler plant and industry in general. Included stainless steel and aluminium. They produced pipework for UKAEA nuclear reactors. 1956 3 contracts awarded for Atomic power stations : AEI-John Thompson Nuclear Energy Co Ltd to build 1 at Berkeley, Nuclear Power Plant Co to build 1 at Bradwell, GEC to build 1 at Hunterston (design by G.E.C-Simon Carves-Atomic Energy Group). CEGB were also negotiating with the group of English Electric-Babcock and Wilcox-Taylor Woodrow to build 1 at Hinkley Point. 1958 John Thompson, Power-Gas Corporation and Humphreys and Glasgow formed a joint venture Nuclear Chemical Plant concerned with process and treatment plant for the nuclear industry. 1959 An advert from the handbook listed all the subsidiary companies but featured an artist's impression of Berkeley Nuclear Power Station. The list of companies showed 20 subsidiaries, including two in South Africa, two in India (in Calcutta and Bombay) and one in Canada. It also mentioned John Thompson Ordnance Co of Wolverhampton, apparently a foray into the arms industry. 1959 Considerable fall in profit due to pressure on margins on long-term contracts and increased cost base including research and development despite working at full capacity in recent years. John Thompson had taken over Thompson Brothers (Bilston) in the past year, a business in similar line (This company seems to have been set up by brothers of one of the early Thompsons in the John Thompson line, and the directors of the two companies were, during the first half the 20th century, cousins). New orders not being gained as fast as previous years. 1960 Nuclear Power Group was formed as partnership between Nuclear Power Plant Co Limited and the AEI-John Thompson Nuclear Energy Company Limited. 1961 Parent of 25 subsidiaries. Works at Ettingshall, Wolverhampton and branch works at Dudley, Leeds and Glasgow. Manufacturers of boilers, heavy and light pressings, chassis frames and axle castings, castings, welded tanks and pressure vessels, structural steel work, coal and ash handling plant and conveyors, water softening plant and nuclear power plant. Employ 9,000 persons. 1962 In an advert, the company is one of the members of the Nuclear Power Group which is constructing nuclear power stations at Berkeley, Bradwell, Dungeness and Latina (Italy). In the Handbook, John Thompson Compost Plant Ltd added to the list of subsidiaries, said to be “specially concerned with the problem of municipal waste and is installing plant in Djakarta, Indonesia.” As they are not mentioned again it is likely this company was formed for this one contract. 1966 A trade directory showed that the Aero/Construction department had become a separate company called John Thompson Fabrications Ltd. Their products included Beacon industrial flooring, stair treads and handrails; constructional steelwork, dampers, hoppers, silos, concrete pouring skips, scoops for earth moving equipment, vessels, tanks, ducting. The Group was reorganised into divisions and John Thompson Motor Pressings Ltd became John Thompson Pressings Division Ltd. The company also had a division at Gloucester called Thompson Trailmobile, producing semi-trailers and containers for bulk transport by road, rail and sea. John Thompson still had Thompsons on the Board: Sir Edward Thompson, J.P., Mr. J. H. N. Thompson, MA, MC, MIMechE and Mr. C. R. Thompson; and eight other non-family directors. Their product list is long and includes axle case housing, vehicle frames, washing machine bowls, chutes, conveyor buckets, ducting, dumper bodies, hoppers, press tools, railcar bogie bolsters, railcar bogie frames, railcar underframes, skips and trays for paper mills. One of the largest de-coring plants in operation at John Thompson (Pressure Vessel Division) at Wolverhampton. The plant was supplied by Spencer and Halstead. 1968 With the support of the Industrial Reorganisation Corporation, Clarke, Chapman and Co and John Thompson tried to take over International Combustion to form a major force in boiler making but after several months Clarke, Chapman and Co withdrew and the bid failed. 1968 Only 30% of the business was now concerned with UK power generation work. Took over Horseley Bridge and Thomas Piggott which was merged with the Pressure Vessel Division to form Thompson Horseley. 1969 Acquired the newly-merged shell boiler business of Cochran and Co and Ruston and Hornsby which would give John Thompson half of the UK market for industrial packaged boilers; the Annan and Lincoln works were merged with the Shell Boiler Division, eventually forming Thompson Cochran. 1970 The Thompson family no longer had any involvement in the John Thompson company. 1970 Clarke, Chapman and Co took over the Thompson Group with the support of the Industrial Reorganisation Corporation; the new company was called Clarke Chapman-John Thompson . 1972 The Pressings Division was sold to Rockwell Standard of America. From January 1973, it became Rockwell Thompson Ltd.
After Rockwell bought the Pressings Division from Clarke Chapman it operated under their control until 1986 when they sold the main works to the Parkfield Group but retained the Axle bay. The Aero site was retained by Clarke, Chapman and Co.
1977 Clarke, Chapman and Co merged with Reyrolle Parsons of Newcastle to form a new company, Northern Engineering Industries, which thereby incorporated parts of John Thompson. The Thompson Brothers part of the organisation, and their works at Bilston, was renamed Thompson Commercial Vehicles. 2004 The Ettingshall factory closed. This page was last edited on 1 February 2019, at 09:07.